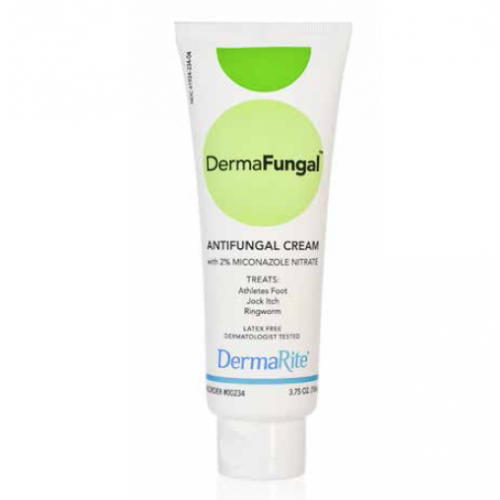 DermaFungal Antifungal Cream Skin Protectant is an Anti-fungal Skin Barrier Protectant Cream that provides excellent protection and prevention of fungal infections. Manufactured by DermaRite, DermaFungal Antifungal Cream treats ringworm, jock itch and athletes foot. DermaFungal can also treat other superficial skin infections. Forming a moisture barrier on the skin, DermaFungal Antifungal Skin Cream may be applied to skin folds to prevent fungal infections. DermaFungal stops odor. The active ingredient in DermaRite DermaFungal is miconazole nitrate at 2%. This antifungal protectant cream is a cost effective alternative to other pharmacy treatments that are much more costly. DermaFungal forms a moisture barrier on the skin. Cost effective alternative to common pharmacy acquired treatments. Size Options: 5 Gram Packet, 3.75 Ounce Squeeze Tube. Active Ingredient: Miconazole Nitrate 2%. Application: Antifungal Skin Barrier Protectant Cream. Comparable Product: Smith & Nephew Allevyn Foam™. DermaFungal is great for skin fold fungal infections. It will treat an existing infection or prevent one from starting.